Top 5 Tips For Wellness and Less Stress in 2019! It’s January 24, 2019 at 0400. 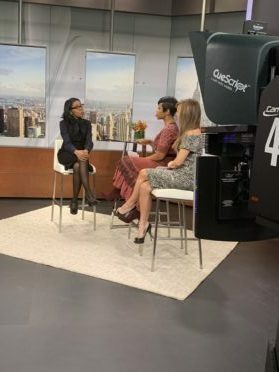 I’m up prepping for my BIG gig in NYC with NBC New York Live hosts Jacque Reid and Sara Gore. Talk about AMAZING! We are LITERALLY getting ready to have a conversation about wellness, and stress management in 2019. Are you F’in kidding me!?!?!?!? Anyway, the topic of our conversation basically covered how to MAXIMIZE YOU in 2019. Click here to view the segment. Check out these 5 tips I offered my newest girlfriends at NBC Live. Do more things that make you feel better; that make you happy. That might include exercising more…I mean, wellness…HELLO! Hanging out with your girlfriends/friends in general; nothing beats a good laugh. Laughter is great medicine. As much as I laugh, I should be less stressed and in better shape than I’m currently in. For the record; I am in purty good shape. Get your hair done. Get your nails done. Get a massage. The take home here is when you feel better; you ARE better. Get plenty of sleep. On average, 7-9 hours for our age bracket, 18-64, is pretty good. Make sure you are getting that “good” sleep. You know, lights out, no cell phone glow, buzzing, or ringing. Try some aromatherapy to relax you. Perhaps some meditation, deep breathing techniques to help center you. Focus you. Relax you. Adequate sleep helps you be the best you. It helps us make better decisions, keeps our immune systems strong enough to ward off illness, AND, it helps our metabolism. Can’t shed those last 10 pounds? Question. Are you getting enough sleep? IJS(I’m just sayin’). Spend more time with your family. Family, for most of us, is our foundation. They are the core group of folks where you generally can “let your hair down,” be yourself. They love you just as you are, faults and all. You can vent to them. Get a hug when you need it. At the end of the day, nothing beats family. They give us love. Strength. Purpose. Keep up with your screenings. I know. Who likes to go to the doctor’s? Not many. Anyway, preventative medicine is the best medicine. Don’t wait for something to go wrong; how about an annual trip to the doctor’s to ensure that things keep going right? Connect with your community. It helps us remember that a world exists beyond our own. Give back. Pay it forward. Volunteer. It gives us a sense of purpose. Gratitude. Worth. Wife, mother, Midwesterner, and award-winning OB/GYN, Dr. Angela is equal parts best girlfriend and bold professional, supporting women’s health with innovative approaches to care and heavy doses of humor. Dr. Angela has done more than launch a successful practice, she has defined herself as a voice for a new generation of womanhood, established her ASK DR. ANGELA brand committed to authenticity, and built a community rooted in trust, candor, and compassion. PreviousPrevious post:281 – Ask Dr. Angela – 2019. What’s In It For You? Next Next post:282 – Ask Dr. Angela – One Size Does Not Fit All. All of the information provided throughout the Site and Service including the information delivered via email, webinars, podcasts and downloadable digital media educating consumers about health, wellness and nutritional cleansing are resources for educational and informational purposes only and should not take the place of consulting a physician. See Full Disclaimer here.